The artistic expression created within hip-hop culture has connected every kind of human being. For an artist to bequeath a revered legacy, the actual artwork must be honest, respected, and possess a universal strength. Like a cultural chain, this universal power links past, present, and future generations. True artists must remain creatively prolific individuals. Edgar Allen Poe was a gifted writer who lived a short life, but his legacy of classic work has persevered for decades. Poe’s artistry is an example of artistic immortality achieved through work. Many contemporary music artists are forgotten when their work does not have the ability to unite the listener with the cultural elements of the artist’s life. While the average hip-hop emcee rarely uses Edgar Allen Poe as a reference, an emcee’s legacy can intensify by learning from writer. In this new millennium, the average hip-hop emcee has an extremely short shelf life. Their recordings are the only elements of their career. The artist’s work is the only enduring element that forges the bonds within the culture. Edgar Allen Floe is a hip-hop emcee who has learned from Poe’s legacy and the mentors of his culture. Floe’s obvious play on Poe’s name is respectful yet representative of hip-hop culture. As a member of the North Carolina’s Justus League, Edgar Allen Floe walked through the music industry’s door that was opened by Little Brother. Although Little Brother started out small, but their classic “The Listening” LP launched them to unimaginable heights within underground / independent hip-hop. 9th Wonder has produced for Jay-Z. Pooh and Phonte have released their own records. Learning from his fellow Justus League members, Poe released quality music to fuel his own ascension. Although Floe started his career as a true individual, he learned from his mentors in Justus League. As Little Brother and Justus League continue to grow in both appeal and recognition, Floe is following their path while walking in his own style. Like a fine wine, the timeless hip-hop of Floe improves with age. The strength in Edgar Allen Floe’s successful inception into music industry is a result of his respectful love of hip-hop injected into music. Although he has not created a copious amount of work like Edgar Ellen Poe, Little Brother, and other Justus League members, he ignited his career with the same spark, independence, and business sense. 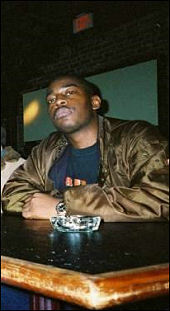 Floe formed his own label, MCEO Records. His magnificent debut EP is just an appetizer for the full meal of his upcoming “The Streetwise LP.” Floe wants people to get use to him because he wants to remain here for a long time. Edgar Allen Floe’s debut “True Links” EP is an excellent slice of musical art that facilitates the universal connection within hip-hop culture. The poignantly thick production is handled by 9th Wonder, Khrysis, DJ Forge, Illmind, Khrysis, Picasso, and Floe (using the name Slicemasta). Instead of featuring many high profile guests, the EP only includes L.E.G.A.C.Y. and Median. Floe handles a majority of the rhyming, giving himself a chance to let his work shine. The songs have a broad range of emotions and topics that maintain the EP’s balance. The assorted themes, sounds, flows, and styles link the listener to Floe. Hip-hop’s power to connect people gives the emcee a slice of immortality through the music. Edgar Allen Floe’s connection with the hip-hop strengthens the bond between listeners and his music. His name links us to the revered writer, Edgar Allen Floe. His EP connects various emotions, themes, sounds, styles, and moods. In my interview with Floe, our respectful love of hip-hop united us to the culture. Floe’s acknowledgement and respect for this power has given him an infinite potential to achieve musical immortality. Will Floe reach his potential? Edgar Allen Floe is just one link in the infinite chain of hip-hop culture. Floe’s musical art will help keep the chain secure. Edgar Allen Floe: Chilling, man. Just woke up. MVRemix: Your debut EP, ‘True Links’ was just released. Tell us about the EP. Edgar Allen Floe: It's called ‘True Links’. It's been getting good reviews so far. I'm proud of it. I have a variety of producers. 9th Wonder, Khrysis, Illmind, and many others. I wanted to get something out there so people could get ready for my full length album, called ‘The Streetwise LP’, which is dropping late this year. MVRemix: What is the meaning behind the title ‘True Links’? Edgar Allen Floe: Since I have seven producers across eight tracks, each producer gives their own unique style. So, the vibe of each track varies. But even though I'm collab’ing with producers with their own style, both of our tastes in hip-hop are the same. We can still click and make a dope track. In the end, the entire project still has a strong cohesiveness to it. Basically, hip-hop cats have a common bond or a true link, when it comes to the music. MVRemix: How is working with 9th Wonder different than working with other producers? Edgar Allen Floe: There's not really much of a difference, other than I actually work with 9th in the studio. Most of the other producers sent me the beats to listen to. I picked what I liked. 9th will tell me that he wants me on a specific beat. Then, we go in the studio and make it happen. He also likes to gives suggestions sometimes, while we're recording. But for the most part, if he gives me a specific beat, he knows the song will be dope. MVRemix: ‘Livelyhood’ is one of my favorite songs on the ‘True Links’ EP. Tell us about the theme, inspiration, and creative process. Edgar Allen Floe: Thanks, man. ‘Livelyhood’ was produced by myself. I have an alias, Slicemysta. I've been making beats seriously for about 4 or 5 years. I just wanted to have a track that ended the EP on a high note, so I decided to use that beat. Also, I wanted to let people know that I can make dope beats. There is not a serious concept behind it. I'm just flexing my lyrical skills. I almost wanted to make some kind of a party or danceable joint that everyone would feel. It turned out really well, so I'll be also producing a few tracks on my full length album. MVRemix: Tell us about your group, The Undefined. Edgar Allen Floe: The Undefined is my immediate group, consisting of myself and my partner in rhyme, Mal Demolish. We've been a group since 1996. We plan on putting out some new music early next year. I do the majority of the production for our group, but Mal makes beats too. We'll be dropping an EP soon, called ‘Plan U’. Get ready for that. MVRemix: Do you have a favorite song on ‘True Links’? Edgar Allen Floe: (laughs).It's tough, man, because since every track has a different vibe. It just depends on how I feel on a particular day. Honestly, I would say the song I can really zone out to is, ‘Timelife’. I just love how that joint turned out. Shout out to my man Obsidian Blue! MVRemix: What song took the longest amount of time to complete? Edgar Allen Floe: I believe ‘Timelife’ was the one, because me and Obsidian Blue were trying to make sure the mix was right. Blue was reworking it a few times, but I told him that we can use one of the first mixes and run with that. You might hear a different mix of that track in the future. Same beat, but just a few more sounds added to it. Every other song on the EP was finished pretty quickly. MVRemix: When you create a song, do you write to the beat or do you have pre-written lyrics or planned out themes? Edgar Allen Floe: I first started writing when I was 14. I used to write all the time. Around 1998 or 1999, I would use a lot of pre-written lyrics for songs. But, probably since 2000, I've been writing to the beats. I like the track to be fresh if the beat is new to me. Also, I can make sure the concept of the song matches the mood of the beat. I wrote to all of the beats on ‘True Links’. On the joint called, ‘The Formula 2005’, I couldn't rap on that song the way I did, without that beat. MVRemix: How did you hook up with Justus League? Edgar Allen Floe: The Justus League was established in 1999. I basically knew 9th Wonder, Cesar Comanche, Median, and a few other members from school. We eventually started working on music together in Yorel's dorm room, and we just kept doing it. The name Justus League was tagged on to what we did. So, we ran with it. "I think the voice plays a part in how the emcee is received by listeners. You have to have style, charisma, and substance as well. Some of the greatest emcees did what they did, without really focusing on the current trends."